Amit Dhankar clinched silver while Commonwealth Games champion Rahul Aware won a bronze as Indian men's freestyle wrestlers continued their impressive performance at the Asian Wrestling Championships..
Commonwealth Games silver-medallist Satish Kumar (+91kg) and the fast-rising Sonia Chahal (57kg) entered the quarter-finals on an all-win opening day for India at the Asian Boxing Championships. Srikanth's compatriot Sameer Verma, who had reached the quarter-finals at Singapore Open last week, improved a place to reach the 15th spot, while former Commonwealth Games champion Parupalli Kashyap..
Britain's Claudia Fragapane has had a tough time since injury denied her a chance at the 2018 Commonwealth Games, but is ready to return to major competition. 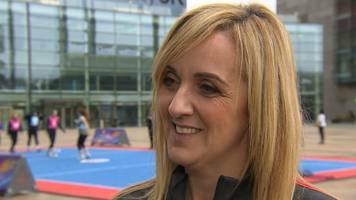 Head coach Tracey Neville says England were "renowned for cracking" before breaking the "glass ceiling" by reaching the Commonwealth Games final in 2018.